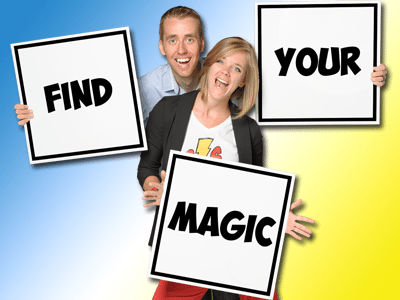 It’s no secret that children love magic which is why Brent and Sarah are able to use it as a compelling tool to hold the student’s attention and effectively convey their message. Magic allows students to use their imagination to see beyond their current boundaries and realize where a strong belief in themselves may take them. Together Brent & Sarah have performed for Disney Cruise Line, the Ontario Science Centre & YTV. Included in the presentation are the following resources that help teachers and students discuss bullying prevention year round. The Anti-Bullying Magic Show is a 60-minute assembly program. At most schools, Brent and Sarah perform a K-3 show and a 4-8 show, but it all depends on the size and grade range of your school. The presentation is also eligible for PRO Grant funding when offered as an evening show for both parents and children. Suitable for progrant. Toronto, Ottawa, Mississauga, Brampton, Hamilton, London, Markham, Vaughan, Kitchener, Windsor, Burlington, Sudbury, Oshawa, Barrie, St. Catharines, Cambridge, Kingston, Guelph, Thunder Bay, Waterloo, Brantford, Pickering, Niagara Falls, Peterborough, Sault Ste. Marie, Kawartha Lakes, Sarnia, North Bay, Welland, Belleville, Cornwall, Timmins, and Everywhere in Between! "The students were captivated by their magic and more importantly their message which aligned well with the school's character development program. It is without hesitation that I would recommend The Anti-Bullying Magic Show." "I fully support this presentation as a principal and as a mother. The show really drove messages home in regards to bullying, building self esteem and believing in ones self." "The show is engaging, age appropriate and has a positive message for students about self-esteem.It has provided us with a set of common messages that we can further utilize in our school-wide anti-bullying measures." "It was a wonderful presentation and I have already recommend it to many other schools. Their message was very important and they had the students of all ages on the edge of their seats and fully engaged in the show." "Staff, students and myself enjoyed an incredible experience with IncrediBrent and Super Sarah. The students were completely amazed by their enthusiasm and their magic tricks as well as their very important message. The message fit well with our school's philosophy and I know the students have benefited from being involved in the performance. Now we can take this to the next level when we talk to students about bullying and what they can do to prevent it." "The show was age appropriate and high energy and the message was sincere, genuine and I really felt a connection was made with the students. Every minute we spent with you was well worth it and I will certainly be recommending you to other schools." "Our students were treated to a wonderfully entertaining magic show by IncrediBrent and Super Sarah, who not only kept us spellbound, but taught us some very important messages to help build self confidence and eliminate bullying behaviour."